There are approximately 5,000 gray wolves left in the lower 48 states. That's not many wolves. In fact, according to a number of conservationists, wolves occupy as little as 5 percent of the land where they historically roamed, which was almost the entire United States. And they nearly went extinct in the early 20th century thanks to frenzied predator control programs. Before all this havoc, there may have been some 2 million wolves strutting across the nation. Today, gray wolves can be found in Idaho, Montana, Wyoming, Oregon, California, Minnesota, Michigan and Wisconsin. "But most of those states have tiny wolf populations," Wendy Keefover, native carnivore specialist for the Humane Society of the United States (HSUS), told The Dodo. For example, California is comprised of just seven or so wolves: a new pack of two adults and five pups referred to as the Shasta Pack, led by an alpha male named OR-7. And now, in a move that HSUS and other animal welfare groups say is part of the ongoing, deliberate " war" against these predators, new efforts in Congress could yet again eliminate or erode some of the most vital laws that protect them. There are two current legislative actions being taken against the gray wolf. The first is the 2016 omnibus bill moving through Congress. The massive funding bill includes riders - additional provisions added to a bill - that will establish regulations to strip away the animal's federal protections under the Endangered Species Act (ESA) in Wyoming, Minnesota, Michigan and Wisconsin. The rider "would also block judicial review of these court decision overrides, stripping citizens of their ability to further challenge the regulations," according to The Huffington Post. 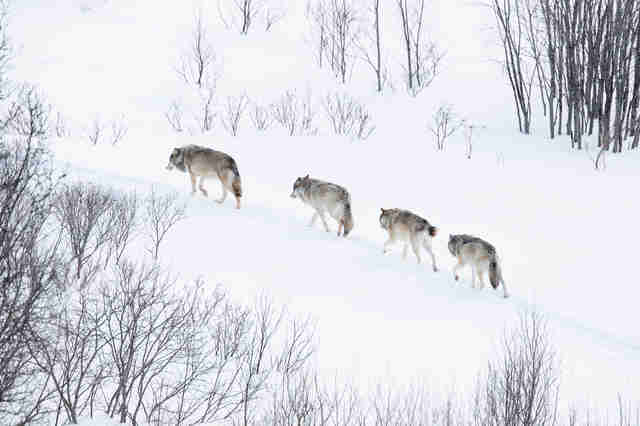 Meanwhile, two U.S. senators, Ron Johnson of Wisconsin (R) and John Barrasso of Wyoming (R), are aiming to delist wolves specifically from their endangered status in the Great Lakes region and Wyoming. That effort will also "prohibit courts from intervening in those states on the embattled predator's behalf," reports the Associated Press. "Wyoming has honored its commitment and put together a solid and working plan to protect the state's wolf population. Even the U.S. Fish and Wildlife Service agrees that wolves should be delisted in Wyoming," Barrasso said in a joint statement with Johnson's office. "This is just one of many legislative opportunities we'll continue to pursue until Wyoming's wolf management plan is protected and fully implemented." "This is huge," Ralph Henry, director of animal protection litigation at HSUS, told The Dodo. "Wolves don't have a national recovery plan. It isn't Congress' place to decide whether species need federal protection." 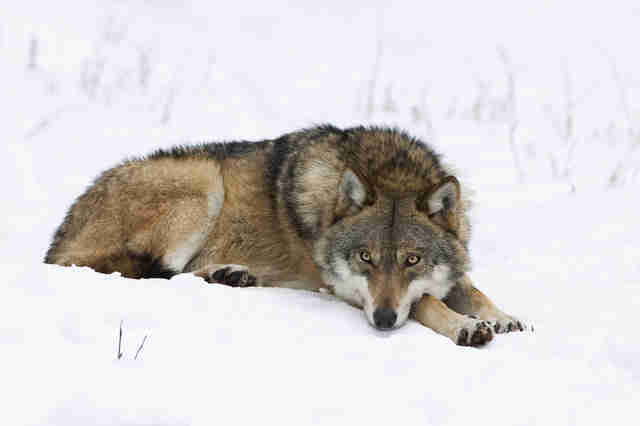 "The vast majority of wolves' historical population loss," adds Henry, "is because of direct, state-sponsored bounties. State-sponsored bounties and rampant intentional killing is what drove the species to the brink of extinction. States like Wisconsin, Wyoming and Montana were literally paying people to shoot wolves. And that is the fear - that we will go back to that status." If this legislation prevails, Henry maintains, wolves will be the target of sport hunters, trappers or government-controlled killing programs alike in these states. "Let's take a step back," Brett Hartl, endangered species policy director at the Center for Biological Diversity, told The Dodo. "Gray wolf recovery in the U.S. has been very patchy. There have been a few places where [the species has] done well, mainly the northern Rockies and the Great Lakes. But by the year 2000, the U.S. Fish and Wildlife Service (FWS) said 'that was enough' in terms of where we need to have wolves in the lower 48, and since then, FWS has tried to delist the wolves from the Endangered Species Act (ESA) and those protections." Hartl argues that FWS has tried to repeatedly remove wolves' protections "piecemeal" and "every time they have done that, the courts have said, 'No, that's not how the ESA works because you have to recover the wolf in its historic habitat.'" However, in 2011, Congress intervened, and delisted the wolf in Idaho and Montana. "What we saw after that," says Hartl, "was the de-evolution of wolf management in those states because the way that Congress delisted them, there was no recourse if the wolf [population] declined." What followed was, in short, something of a free-for-all hunt on wolves: no quotas on wolf killings, the introduction of policies that allow wolves to be shot-on-sight and an uptick in wolves who were hunted and killed from the air. "And it knocked down the population," Hartl says. Hartl says the same scenario is now happening in Wyoming and the Great Lakes region, in addition to Idaho and Montana. "The danger of these riders," he adds, "is that they are inside such important legislation, where we are forced to accept them. The omnibus bills are the big budget bills that basically fund the government. So you are forced to swallow some of the riders versus [being] against keeping the government's lights on." "Our latest numbers show that the gray wolves are self-sustaining," Vanessa Kauffman, a public affairs representative with FWS, told The Dodo. "FWS conducts rigorous analysis in reviewing species listings and delistings and takes into consideration factors such as suitable habitat. The service believes the gray wolf [population] has recovered and the ranges that the wolf has recovered into are appropriate." HSUS is one of more than 150 organizations that, in a public letter, have requested President Obama reject the final spending legislation for 2016, which includes these riders. To contact your legislator about the issue, go here. A former version of this article attributed a quote by Sen. Barrasso to Sen. Johnson.